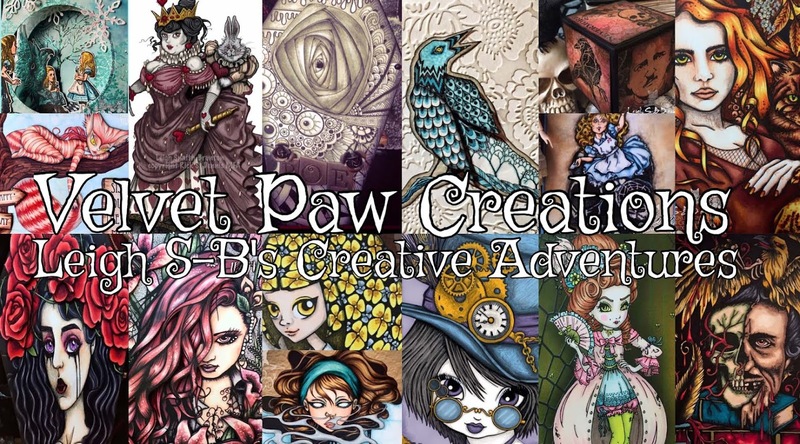 Velvet Paw Creations: Steampunk TagART featuring Blockheads new Victorian Invention stamps! 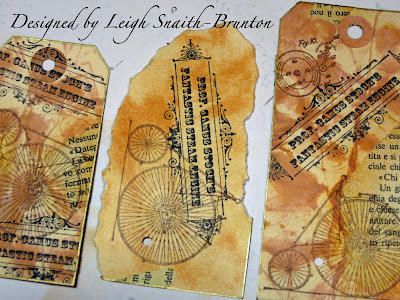 Steampunk TagART featuring Blockheads new Victorian Invention stamps! 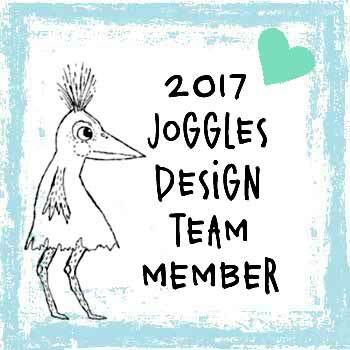 I'm back with another Blockheads Design Team creation for you to check out! 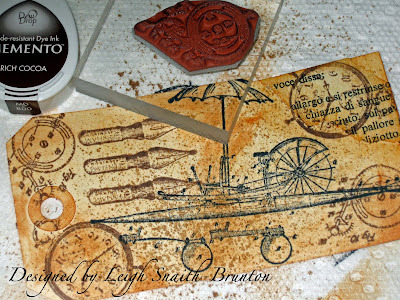 I had a lot of fun designing this Steampunk TagART which showcases Blockheads Paper Arts newest stamp release Victorian Invention! 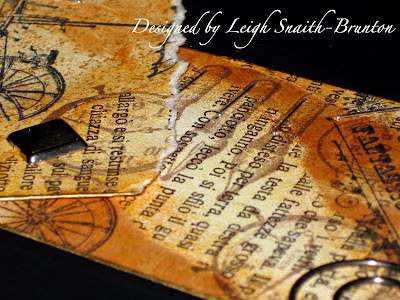 This collection of 6 stamps is awesome and will appeal to all the Steampunk enthusiasts as well as stampers who enjoy the Victorian Vintage style too. It's available unmounted or cut on cling cushion and you can also get the individual images too! 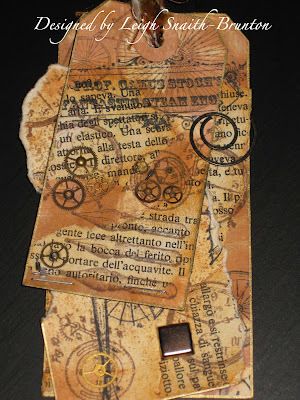 I came up with this 3 piece TagART idea when I imagined the eccentric inventor carrying this tattered bundle of jotted notes and sketches around with him. 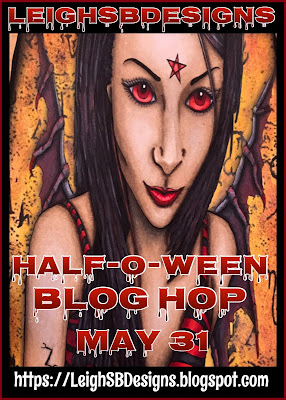 The pages are well worn and torn and falling apart and held together with fibers and metal clips. 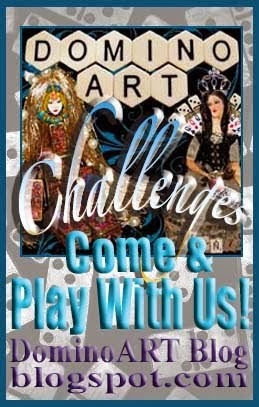 So let's get our fingers inky! 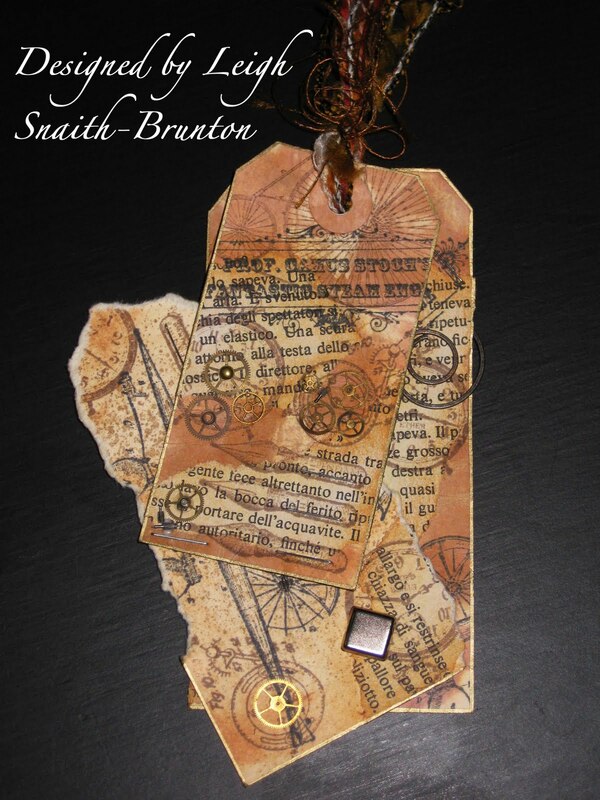 I used 3 tags for this piece, 1 small and 2 standard manilla shipping tags. 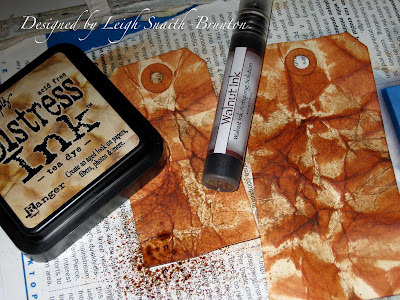 Start by distressing the small tag (Tag#1) and one of the standard tags (Tag#3) by scrunching them up and applying Distress Ink Tea Dye directly to and spritzing them with Walnut Ink in a random fashion. To mute the colours and to flatten out the creases I like to wet the tags by holding them under running water briefly. Pat dry on a couple of layers of paper towel. I didn't want the second standard tag (Tag #2) to be as distressed so I just put it under the other tags while I was patting them dry and some of the inks got transfered to it. Peel off the circle hole protectors on the tags if they didn't already fall off. 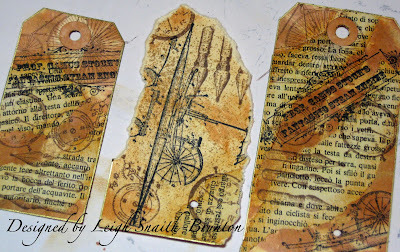 I then ironed the tags with a craft iron until they were flat and dry. Glue the hole protectors back on now but if you don't want them stamped then glue them back on later, just a personal preference really. 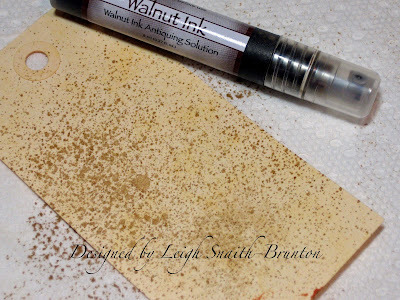 Spritz Tag#2 gently with Walnut Stain. 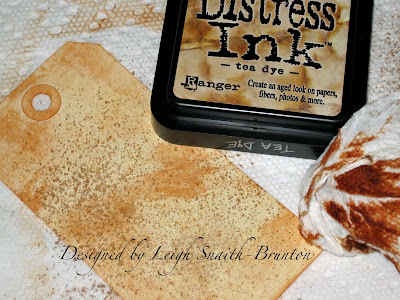 Apply a bit of Tea Dye Distress ink to it with a piece of scrunched up paper towel. 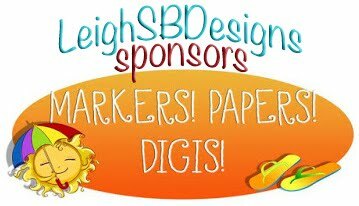 Tear up a page of foreign text and adhere to all 3 tags with a glue stick. 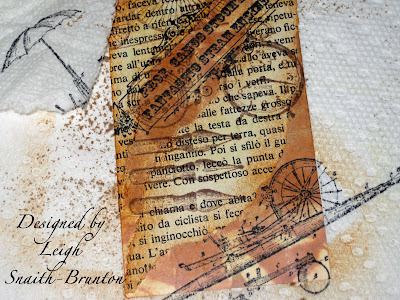 Age the torn text areas first with Ancient Page Lemon Peel. 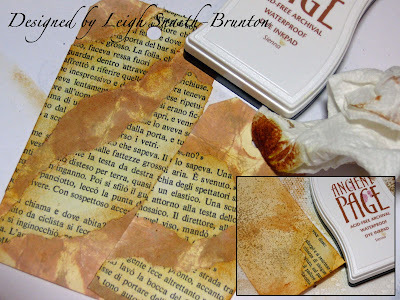 Then with Ancient Page Sienna. 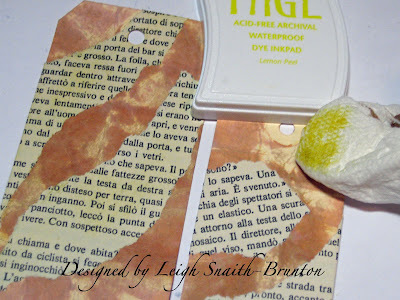 I used Ancient Page coz it's the inks I have but any dye ink will do the trick! 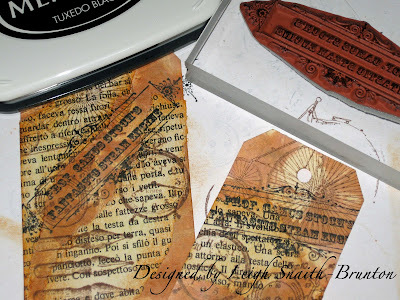 Stamp the Steampunk flying machine onto Tag#2 with Versafine Onxy Black ink. 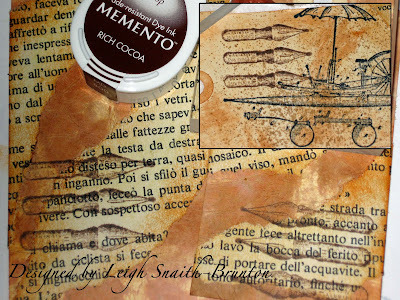 Stamp the Pen nib image in a row of 3 on all 3 tags with Memento Rich Cocoa. 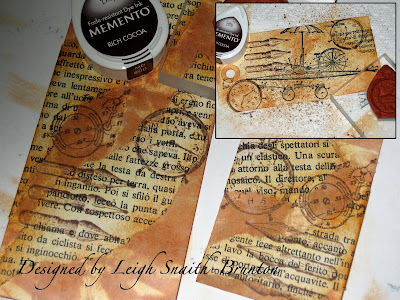 Stamp the Ether Meter and Gears Diagram on all the tags with Memento Rich Cocoa. 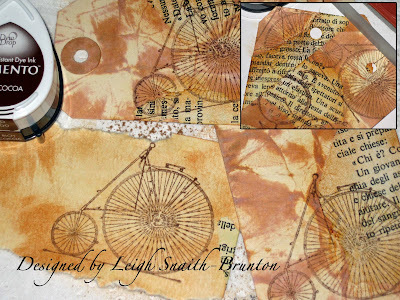 Stamp the Penny Farthing (the vintage bicycle) onto the front and the back of all 3 tags with Memento Rich Cocoa. 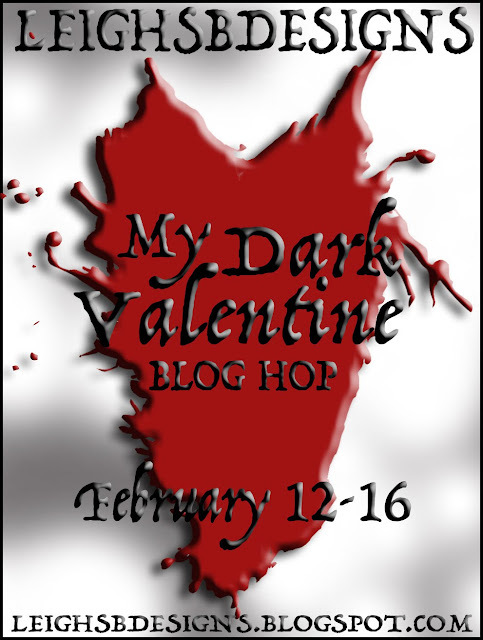 Then stamp the Prof. Camus banner in Versafine Onxy Black ink onto Tag#1 and #3. 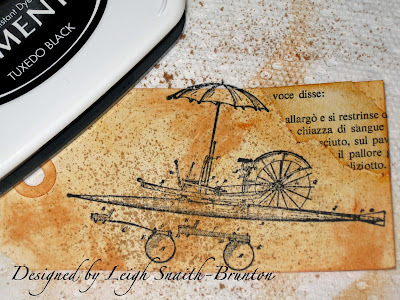 Then stamp the Steampunk Flying Machine onto Tag#3 in Onyx Black. 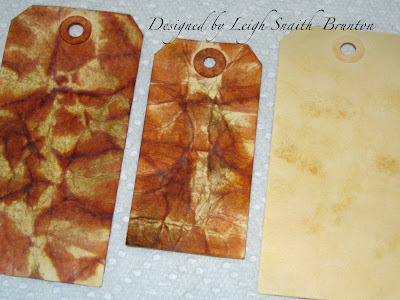 This is what the front of the tags look like after all the stamping is done (left to right: Tag#1, #2 and #3). Lay Tag#2 on top of Tag#3 and punch a small hole. And a view of the backs. 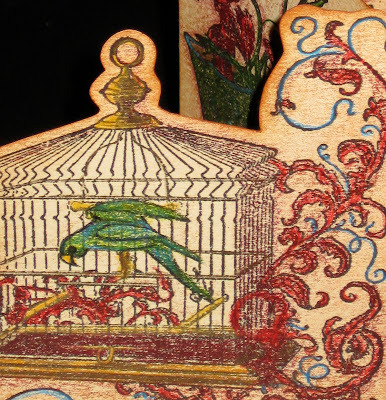 Punch a tiny hole in the center of one of the clock images on Tag#1 and attach a watch gear with a tiny gold brad. Embellish Tag#1 and #2 with more watch parts and I also added silver staples to the pen nib images and other areas on all 3 tags to give them an industrial feel. Attach Tag#2 to Tag#3 with a square silver brad. Put Tag#1 on top and secure all 3 tags together with a selection of colour co-ordinating fibers. 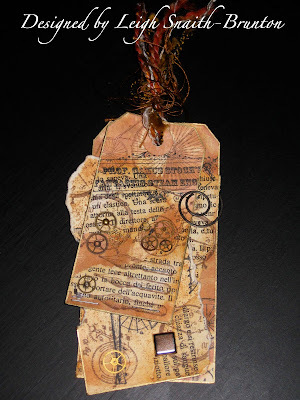 Finish off with an antique clipiola (Italian circle paper clip) to keep the tags stacked and when you want to view them just slide the tags out to the left. 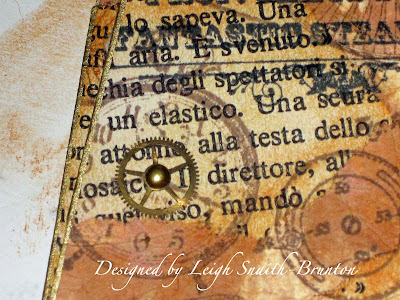 Thanks for joining me on my Steampunk Creative Adventure today! 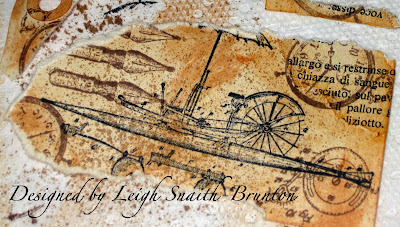 I really enjoy reading your comments and would love to hear what you think of my Steampunk TagART! 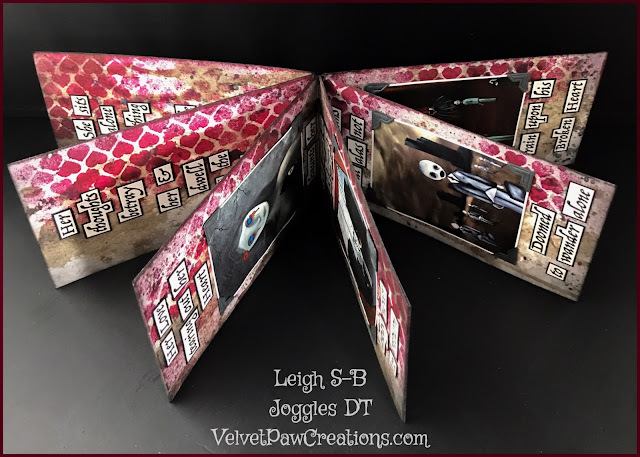 For more Blockheads inspiration check out Karen's Victorian inspired card that's blooming with texture and romantic faded colours featuring the Victorian Eccentricities collection! 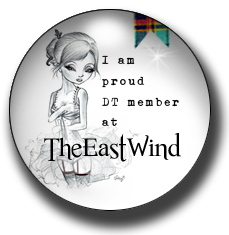 Fabulous project. 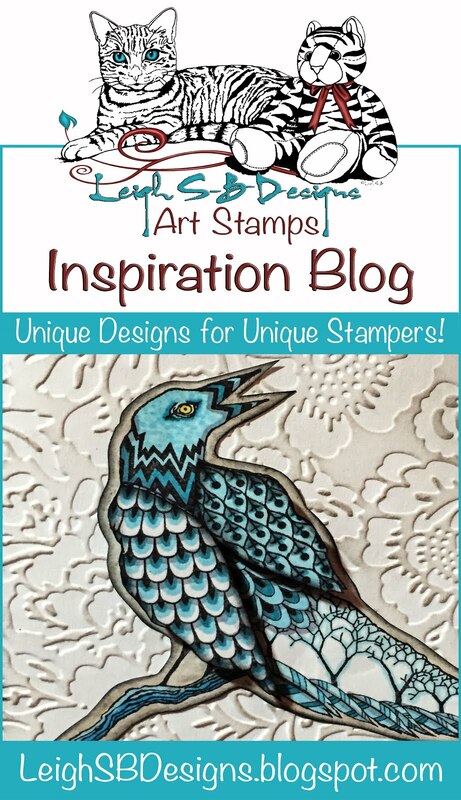 I love the thinking behind your inspiration. So clever. Great tutorial too. The metal watch pieces are a great touch. WOW!!!! WOOOOOOOW!!!! I love your tag! 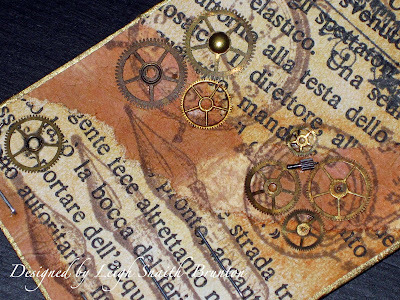 I love steampunk!!!! WOW! It´s amazing!!!! Love this look, and so many products I have, I actually think I could do something like this too. 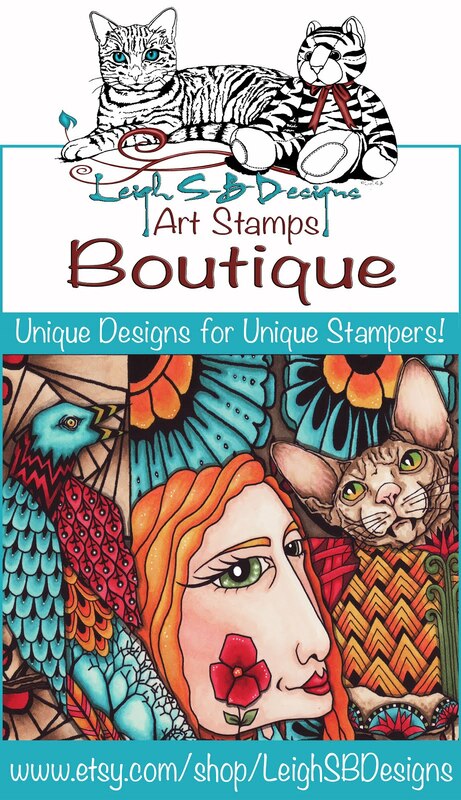 Just need those super cool stamps! 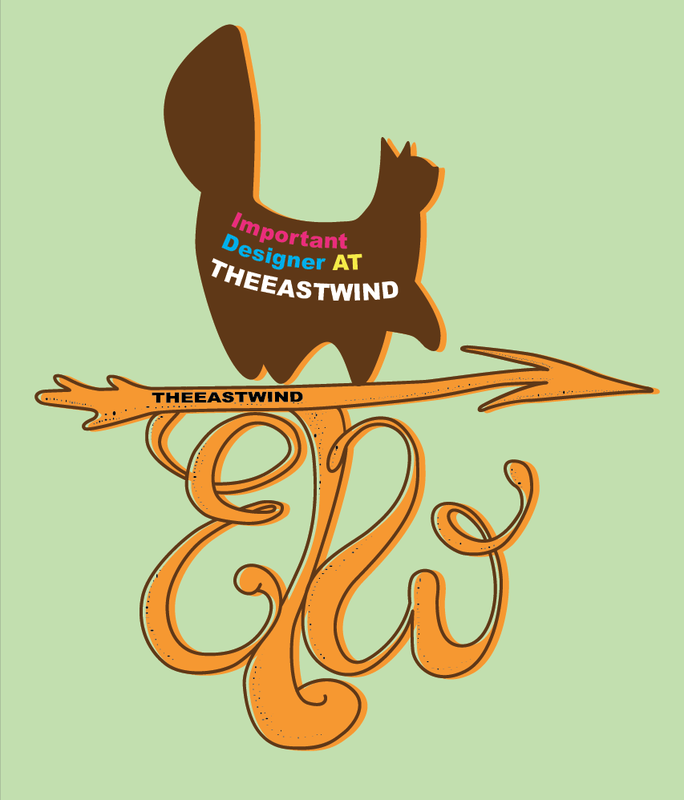 Thanks for the inspiration and all the detailed instructions.